The stock picking strategy based on difference in intrinsic value and current market value of a stock, making it an undervalued stock, is known as value investing. Warren Buffett, had absolute faith in this strategy, most of his fortune made from the stock market having been acquired with the help of this strategy. The concept was introduced by Benjamin Graham, in 1930, and has since then proved its worth through numerous stock market success stories, resulting from implementation of value investing, as a stock selection strategy. The strategy is essentially a reliable, tested, and excellent tool for picking stocks for investment, whether it is for trading or investment purpose. 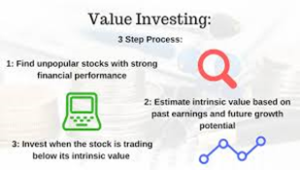 The various steps to be employed for value investing consists of identifying the companies, stocks of which are trading below the accurately calculated intrinsic value, on the stock market. These stocks are also known as undervalued stocks, and the next step is to monitor the stock price on the exchange, making a purchase when the stock is in a declining trend, as indicated by the technical graphs. This stock investment strategy is based on the belief that stock markets are driven by trader sentiments, which cause substantial price fluctuations on the basis of news related to the company. A decline in the market value of a stock due to negative news, which is immaterial to the performance or future of the comp any, can be exploited for picking up a stock with high intrinsic value, capable of providing high returns on investment. The theory which contradicts the strategy of value investing, is efficient market hypothesis, proponents of this theory are of the belief that the market value of every stock denotes the intrinsic value of the company as it is a complete and accurate representation of all the fundamental factors impacting the value of a stock. This theory proposes that stocks are always traded at the accurate intrinsic value for that stock, on the stock exchanges, so it is incorrect to assume that profits could be achieved through picking undervalued stocks or overvalued stocks. Value investment as a strategy however, has proved its worth, with many investors identifying stocks which have a future value much higher than the value that they are being traded at, and deriving exceptional returns. Value Investment strategy is however, not as simple as it sounds. It does not consist of picking up any stocks which are trading at lower than the general market price for the given stock. A stock cannot be picked up on the basis of the stock price trend only, but is identified through extensive calculation of intrinsic value of the stock through close scrutiny of all the financial statements, as well as, qualitative analysis. At any given time, the stock market has hundreds of stocks which exhibit a sudden decline in the price, as compared to the price the stock usually trades at, this does not indicate that all the stocks are good buys, as many on the stocks might have suffered a decline due to bad performance of the company. This is where, extensive fundamental analysis plays a role in helping to identify accurately, the stock which is backed by strong fundamentals, and will therefore show exceptional growth in the near future. Calculation of intrinsic value of the stock ensuring that the market price is below 2/3rd of intrinsic value. That would be for a share of intrinsic value of $60 it should not be trading for more than $40. The price to book ratio or P/B ratio should be low. Every company reveals the book value of the shares as mentioned in the quarterly financial accounts released. The current market price is divided by the book value then compared to the industry average. The comparison should indicate a PB ratio below the industry average. This also indicates the value of the share for the company, and in the market. The price earnings, P/E ratio of the previous years, is also an important consideration while purchasing stocks, as it provides ratio between the current market price of the stock and the income generated per share by the company. An investor needs to look out for P/E ratio of the company to ensure the current ratio is below 40% as compared to previous 5 years. Price and earnings to growth PEG ratio, is utilized for understanding the growth of the company as signified by its earnings. PEG ratio is calculated by dividing the stocks P/E ratio with its growth rate for the same period. The preferable range for this ratio for value investing is below 1. The debt equity D/E ratio, exhibits the amount of liability per share a company owes. It gives a good indication of the financial stability as regards debt of a company. The total liabilities of the company are divided by the total equity sh are capital. This ratio should be compared with the ratio of other companies within the same sector only as every sector has different debt requirements, which may lead to an erroneous analysis and interpretation. Certain sectors have a requirement behind it due to the Sector itself been very capital-intensive. In these sectors, a high debt equity ratio is not necessarily a negative. The growth of earnings of a company is another major consideration, given that the investment is to be long term and with intention of buying into the company, earnings should be projecting a growth of at least 7%. It is also important to analyze the stability of the company by ensuring that in no 2 years, in the last 10 year period, has the growth ever fallen below 5%. Another important consideration for ensuring success in identifying of stocks through value investing strategy is provision of a buffer, or margin of safety as is the term technically used for stock investment, to avoid any loss resulting from, miscalculation of the intrinsic value of the stock. Depending on the comfort level for exposure to risk of the individual, the amount of buffer required can be decided. A margin of safety, between ten px ercent and twenty five percent, of the intrinsic value of the stock, is recommended by experts. This minimizes exposure to risk, as well as, probability of losses from investment due to erroneous calculation of intrinsic value. Value investing also has a few drawbacks associated with the strategy. The most important drawback of using the strategy is the identification of undervalued stocks which can be extremely difficult requiring a lot of expertise as well as, knowledge of the economy and the dynamics which prevail therein, along with all factors which can internally, as well as, externally impact prices of stock. Stock market investments are subject to market risk, is an often repeated statement which needs to be taken very seriously. Every stock market investor needs to understand that no stock comes with the guarantee no matter how much ever expertise on knowledge may have gone into a thorough analysis of the stock and the company from every angle. Another downside to value investing is that it requires extreme patients for the long term investors as it may take numerous years for change in market sentiment to bring about substantial increase in market value of the stock, to meet the target price of the investor. The weight of course may be worth its while, and extremely rewarding at the end. The other side of the coin is when an investor may be forced to dispose of the stock, after a futile wait for a long period, in expectation for the stock price to show substantial uptrend. Value investors need to have extreme self confidence in not only the abilities but also the choice of stock once decided upon. Value investors always investing contrary to stock market trends, as they pick stocks at a low which are generally being sold off by most investors, at the given moment. Therefore, an investor may often get unsettled when a chosen stock, does not exhibit the expected uptrend within a certain time frame. Value investors generally not able to implement sufficient diversification due to restricting their investment to certain sectors which are presently underperforming but expected to do exceptionally well within a future time frame. Value investing can be an extremely rewarding stock investment strategy, provided one selects the stocks judiciously, and has the required patience and confidence to await results. At Beat any Investment, all our experts have the required experience and knowledge, to excel at every stock picking, as well as, investment strategy, required to ensure the best possible return on investment. Our team of experts is available to help you find the perfect investment solution, at any time.